The new team, which wound up being named ‘T-Wolves Gaming,’ jumped right into action, participating in the very first NBA 2K league expansion draft alongside the Atlanta Hawks, Brooklyn Nets and Los Angeles Lakers affiliate teams in September, where they were able to snag two of the league’s top players. The Timberwolves even built a brand-new training facility located on the second floor of Mayo Clinic Square in the space formerly known as the Experience Center. 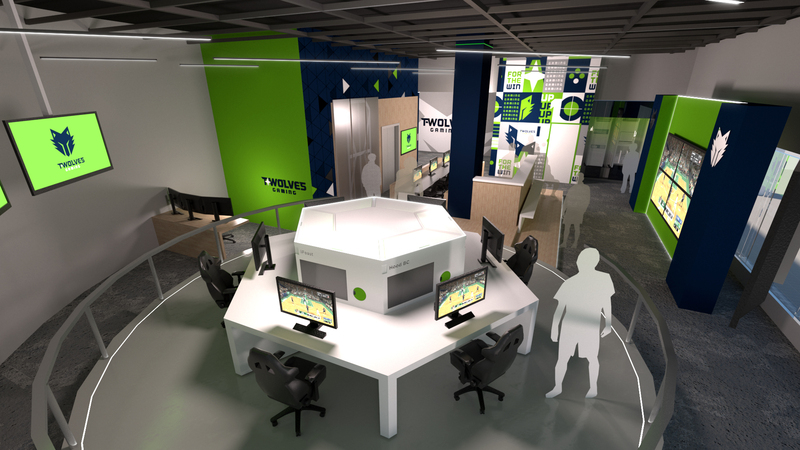 The facility, which is the first of its kind in Minnesota and state-of-the-art in the NBA 2K League, includes space for the players’ practice and training needs, as well as operations and team content. So, what can we expect from this team or the league in general? Well, let’s take a closer look at both. The NBA 2K League is a professional eSports league created by the NBA and Take-Two Interactive. Featuring the best NBA 2K players in the world, it’s also the first official eSports league operated by a U.S. professional sports league. Seventeen NBA affiliated teams participated in the inaugural season, which tipped off on May 1, 2018. Teams compete in 5 vs. 5 gameplay using unique characters that do not exist in the NBA. The inaugural season of the NBA 2K League culminated with the first-ever NBA 2K League Finals on Aug. 25, 2018, where Knicks Gaming defeated Heat Check Gaming 2-0 to become the first-ever NBA 2K League Champions. The NBA 2K League and the now 21 teams have more than 1.8 million combined followers on social media, and their digital content has generated more than 152 million video views across all NBA and NBA 2K League social media platforms which have helped the NBA 2K League teams form more than 90 corporate and marketing partnerships in season one. NBA 2K is currently the highest-rated and best-selling sports title of the current console generation among U.S. sports leagues, which helped NBA 2K18 sell over 10 million copies worldwide. Additionally, the global audience for eSports is expected to reach 557 million by 2021, including 250 million eSports enthusiasts and 307 million occasional viewers. The 2019 NBA 2K League season began on April 2 with ‘The Tipoff’ Tournament and will last 18 weeks — concluding on Aug. 3 with the 2019 NBA 2K League Finals. All NBA 2K League games and tournaments will be streamed on Twitch. Weekly regular-season matchups will take place on Wednesdays, Thursdays and Fridays from 6-11 p.m. ET. Teams will live in their home markets during the season and will compete in league play each week at the NBA 2K League Studio Powered by Intel in New York City. On Sept. 26, 2018 The NBA 2K League held its first expansion draft. Each of the four expansion teams selected two players from a pool of 68 players who participated in the inaugural season and were not protected by their original team. The expansion draft was a two-round snake draft, with the draft order being determined by a draft lottery conducted by drawing ping-pong balls in random order from the official ball machine that is used for the NBA Draft Lottery. T-Wolves Gaming received the third pick in the draft and ultimately selected Timothy “oLARRY” Anselimo from the Milwaukee Bucks gaming affiliate, Bucks Gaming. Anselimo was later traded to Cavs Legion GC in exchange for Brandon “HOOD” Caicedo. In the second round, they selected Mihad “F E A S T” Feratovic, who spent the inaugural season with 76ers GC. The NBA 2K League 2019 Draft took place on March 5 at Barclays Center in Brooklyn. The 198 draft-eligible players consisted of 144 new players selected by the NBA 2K League after an extensive tryout process, six players from the league’s APAC Invitational that took place in Hong Kong in February, and 48 unretained players from the inaugural season. 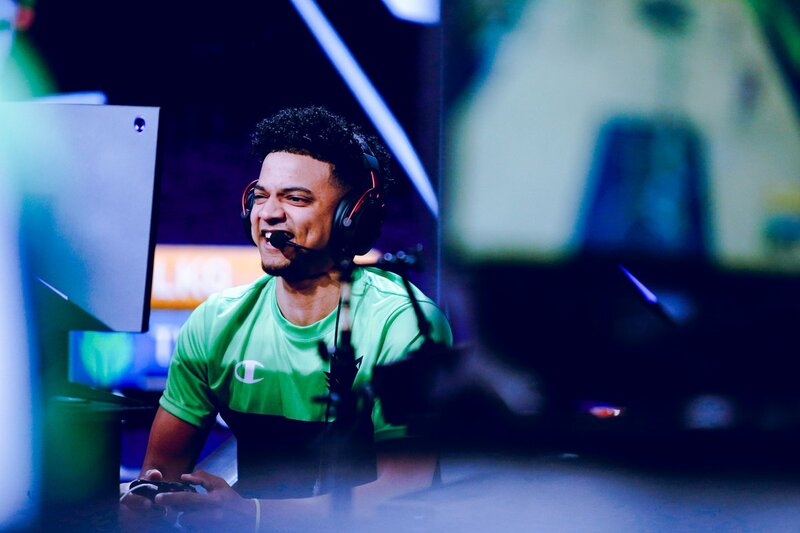 With their first selection in the draft, T-Wolves Gaming selected Michael Key AKA BearDaBeast, a point guard from Cooleemee, N.C. Bear is one of the most decorated guards in Pro-Am history in addition to playing college basketball at Piedmont International University. With their second selection, they took Christopher “TURNUPDEFENSE” Anderson, a power forward from Los Angeles. A tenacious defensive presence committed to making his team, Christopher played for Cavs Legion GC during season one of the NBA 2K League and competed in the 250k MyTeam Championship in Charlotte, NC during All-Star Weekend. Josiah “JoJo” Oetjen, a power forward from McCordsville, Ind. was T-Wolves Gaming’s third selection in the 2019 draft. Josiah is a former collegiate basketball player at Cincinnati Christian University. Originally from Indiana, he interned with Pacers Gaming during season one of the NBA 2K League. With their final selection in the 2019 NBA 2k League Draft, T-Wolves Gaming selected Brian Traynor Jr., AKA NachoTraynor. Brian was a member of Magic Gaming during season one of the NBA 2K League. With a fine arts degree from the University of Miami (OH), Nacho is as good with a paintbrush as he is with a controller, as he is also known for being one of the game’s most versatile players. The team arrived in Minnesota three weeks before the start of the season to begin training. Having never played NBA 2K with each other before, three weeks wasn’t a very long amount of time to build chemistry, even with their state-of-the-art training complex, so the team had some kinks to work out during its opening match at ‘The Tipoff’ Tournament on April 3rd. Even after some opening game jitters, T-Wolves Gaming was able to defeat Grizz Gaming fairly handily by a final score of 53-39. T-Wolves Gaming’s defense stifled the offensive game plan from the Grizz, limiting Memphis to 22 points through three quarters, while Caicedo tallied a game-high 15 points on 6-of-14 shooting. A few hours after beating Grizz Gaming, T-Wolves Gaming was back in action, this time against Wizards District Gaming. Falling behind 15-5 relatively early, T-Wolves Gaming fought back hard, outscoring the Wizards 70-30 the rest of the game, even going on a 17-0 run at one point during the first and second quarter. The game featured impressive performances by Key, making 6 of 10 from the 3-point line, Caicedo who put up 19 points on 7-of-12 shooting, Feratovic dominated the paint with 16 points and 13 rebounds, as well as six steals from Anderson, showcasing how well this team can perform together, even with minimal time to build chemistry. Unfortunately, despite a monumental effort by Feratovic, who put up 17 points on 8 of 9 shooting while simultaneously grabbing 17 rebounds, T-Wolves Gaming lost in the quarterfinals of ‘The Tipoff’ Tournament to the eventual champions, 76ers GC. A double-double put up by Ethan “Radiant” White, alongside 64 percent shooting from the 76ers proved too much for T-Wolves to overcome and their weekend was brought to an early ending. T-Wolves Gaming had an incredibly tough matchup straight out of the gate, drawing Bucks Gaming for their first game of the season on Wednesday, April 10. While many around the league believed the T-Wolves backcourt would be one of the most difficult to handle, Bucks Gaming proved they were up for the challenge early in the season. In the game, Key and Caicedo were held to just 28 points on 11-of-25 shooting from the floor. On the other side, an incredible performance by Aaron “Arooks” Rockwood, who put up 32 points, helped lift Bucks Gaming over the T-Wolves by a score of 80-57. Most impressive from the match, though, was Bucks Gaming stats from the 3-point line, shooting 17 of 26 on their way to what may be a record performance in NBA 2K. T-Wolves Gaming wasn’t down and out for long, though, as they were back in action on Thursday night to face off against another expansion team, Lakers Gaming. The T-Wolves took control early, taking a quick 11-5 lead with some impressive makes from behind the 3-point line. By the end of the second quarter, the T-Wolves led by twenty points and never looked back. An admirable performance by Key, who put up a double-double (19 points/11 assists) and an outstanding night of shooting for Oetjen who went 8/8 from the floor made it for an easy second half against Lakers Gaming, and the T-Wolves won the matchup 69-58. 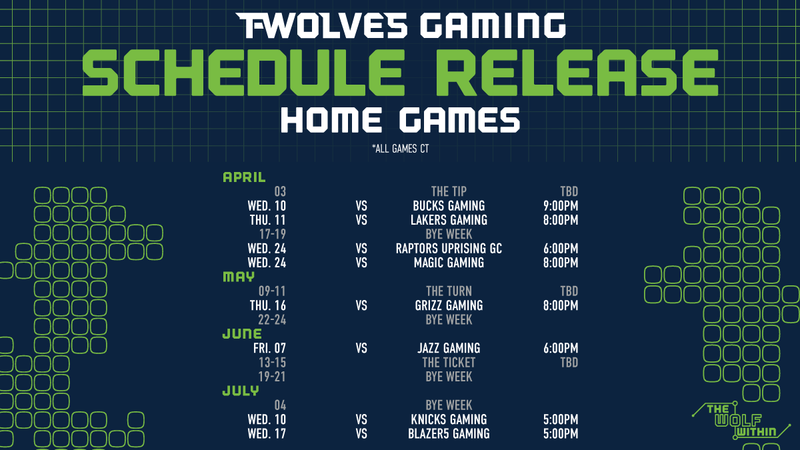 Fortunately for T-Wolves Gaming, they have a bye-week scheduled the second week of the season. This off time will give the team an early opportunity to look back at their performances so far, establish what they have been doing well, work on things that may not be working, and, of course, continue to build that team chemistry that is unbelievably important in this sport. 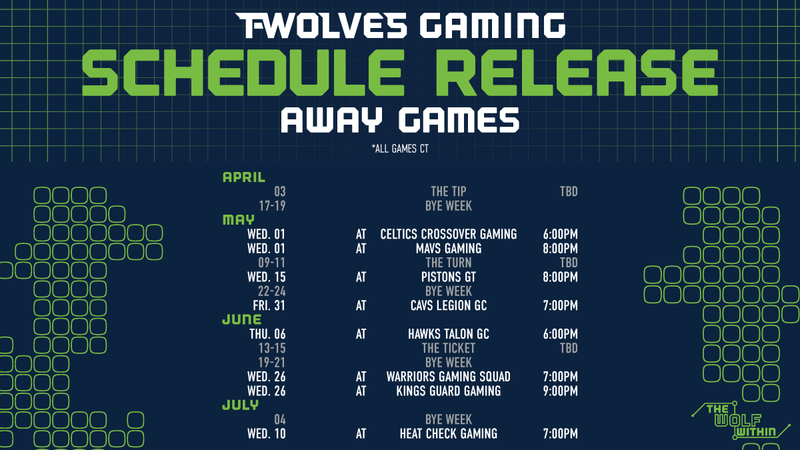 After that, the T-Wolves will be back in action two consecutive weeks, with games scheduled against Raptors Rising GC and Magic Gaming on Wednesday, April 24th as well games as against Celtics Crossover Gaming and Mavs Gaming on Wednesday, May 1st. The regular season will come to a close on Wednesday, July 17 with a matchup against Blazer 5 Gaming, and the 2019 NBA 2K League Playoffs will kick off the following week on Wednesday, July 24. Next articleAsk a Twin: What’s it Like to be Byron Buxton’s Teammate as a Pitcher?